Organ of vision serving to perceive shapes, distances, colors and motion. Duct opening out into the nasal fossae through which tears produced by the tear glands are discharged. Organ secreting tears that flow over the surface of the eye to lubricate and cleanse it (eliminate dust and germs). Strong fibrous opaque membrane covered by the conjunctiva; it surrounds the eyeball and protects the inner structures. Central orifice of the eye whose opening varies to regulate the amount of light entering the eye; light causes the pupil to contract. Thin movable muscular membrane descending from the upper edge of the eye. The eyelids protect the eye, emit tears and discharge waste. Batting of the eyelashes is very frequent. Colored central portion of the eyeball composed of muscles whose dilation or contraction controls the opening of the pupil. Small reddish mass located at the inner corner of the eye formed by the fold of the conjunctiva. 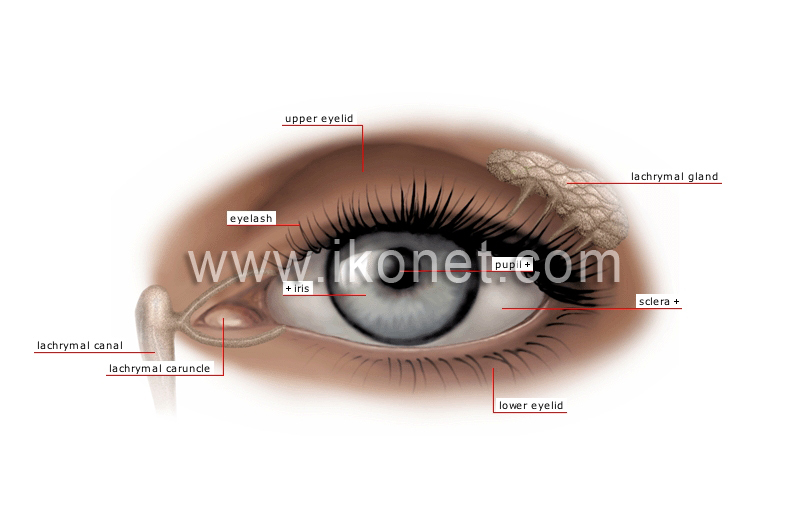 Each of the hairs lining the free edge of the eyelid; they prevent dust and other particles from entering the eye.